Neil Gaiman's The Ocean at the End of the Lane has been voted 2013's Book of the Year, winning the public vote "by a considerable margin". 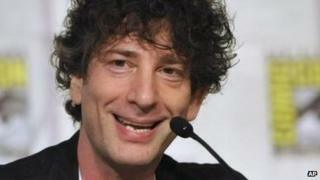 Gaiman's fantasy novel beat fellow National Book Award winners including Kate Atkinson and David Walliams. The tale about a man returning to his childhood home for a funeral won the public vote from a shortlist of this year's 10 National Book Award winners. The graphic novelist said he was "amazed and thrilled". "I've never written a book before that was so close to my own heart - a story about memory and magic and the fear and danger of being a child," said Gaiman. "I wasn't sure that anyone else would like it. Gaiman's novel had already won in the Audiobook of the Year category. The book secured the public vote from a shortlist including Gillian Flynn's bestseller Gone Girl, David Jason's My Life and schoolgirl Malala Yousafzai's I Am Malala to win the Book of the Year title. Online voting for the title, the only book award chosen by readers, closed on 19 December. Last year's winner was EL James' raunchy blockbuster Fifty Shades of Grey, while Caitlin Moran's How To Be A Woman and David Nicholls' romantic novel One Day have also taken the prize. Dame Mary Perkins, founder of the award's sponsors Specsavers, congratulated Gaiman on "this fantastic award". "The competition was tough but to be chosen by members of the public as well as your industry peers truly is a tribute to hard work, dedication and creativity," she said. Gaiman made his name writing graphic novels including The Sandman series and Coraline. He has penned two recent Doctor Who episodes featuring Matt Smith and is currently writing a prequel to The Sandman. A TV series of his book American Gods is in development.